Whether you're teaching a unit on dinosaurs or simply want to get creative with some future paleontologists, easy dinosaur crafts provide some fierce fun for everyone involved. From soap eggs to sock puppets, kids of all ages will love crafting their own dino-mite creations using these fun dinosaur craft ideas. Put a dino in your soap! This cute soap project is easy for most children with some adult help, and kids will love using their soap to uncover the dinosaur toy inside. You can find clear glycerin soap at most craft stores. Grate the glycerin soap using your kitchen grater. Put the shreds of soap and ¼ cup warm water in a resealable plastic bag. Add one drop of food coloring if desired. Knead the mixture through the bag until it is smooth and the water is mixed with the soap. If you have used food coloring, the color should be evenly dispersed throughout the soap. Remove the soap from the bag. Split it into two or three parts, and shape each into an egg shape around a plastic dinosaur toy. Allow the soap to set up by leaving it in the open air. Once it's solid you can wrap it in plastic wrap or use immediately. 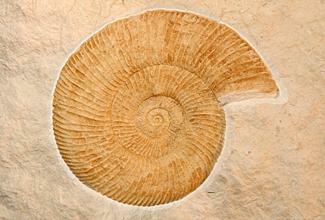 Making fossils helps children understand how they occur in nature. This is a fun and simple craft that is easiest done with third through sixth grade children. Pour the sand into the bottom of the trays. Make an indentation in the sand with a plastic dinosaur or shell. Mix the plaster of Paris according to instructions on the box and pour it over the sand to a depth of about one inch. Turn the tray over, and carefully remove the plaster of Paris mold. Brush the sand away, and you should see the fossil of your dinosaur. 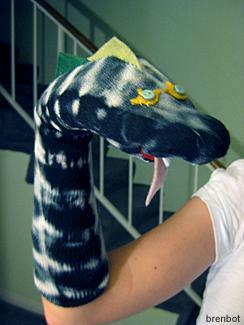 Sock puppets are lots of fun for children of all ages. They are easy to make and are a great way to use those mateless socks. Have the child place the sock on his or her hand, and work together to arrange the facial features of the dinosaur. Glue the items on the sock puppet any way you (or the child) like. Use the purchased eyes, or use buttons or felt for eyes if you wish. Allow the puppet to dry before using. Note: If you are doing this craft with preschoolers, keep in mind that you shouldn't use anything that they can swallow or choke on. Creating your own sidewalk chalk in the shape of dinosaur eggs is a fun way to take the dino fun outside. 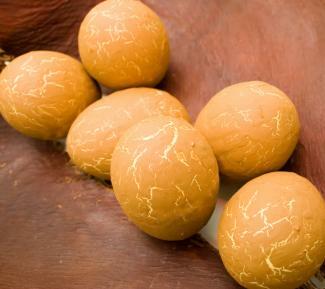 Include small metal dinosaur figures inside the chalk eggs for an added surprise. Measure out two cups of plaster of Paris and dump into the mixing container. Add one and a half cups of water, and stir. Add a small amount of the tempura paint powder to achieve the desired color. Pour the mixture into the egg containers, filling both halves. Add a dino toy if desired, and then press the two halves together. This can get messy, so you may want to do it outside. Allow the eggs to dry for at least 24 hours. When the eggs are dry, take them out of the containers. Paint them as desired, using a very dry tempura paint mixture. Allow the paint to dry. 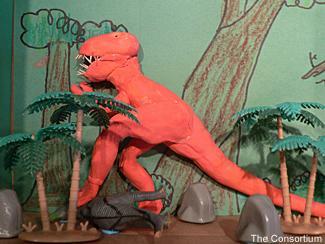 A dinosaur diorama can be a fun way to understand the type of environment in which the dinosaurs lived. This is a perfect craft for older elementary-aged children. Line the shoebox with construction paper. You can use blue on the top and back and brown and green on the bottom and sides. Glue it in. Glue cotton balls to the blue sky. Create a volcano with crumpled brown construction paper and glue it to the back. You can glue red glitter around the top to represent lava. Using poster board, add trees and plants. Create waterfalls and rivers with blue cellophane. Use pipe cleaners to create plants and other items. Use your imagination to create other elements for your dinosaurs to live and roam in. 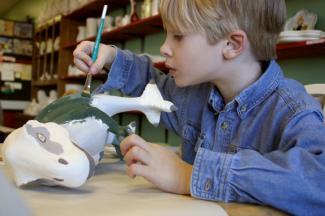 Sculpting with paper clay is a fun, hands-on craft for older children. 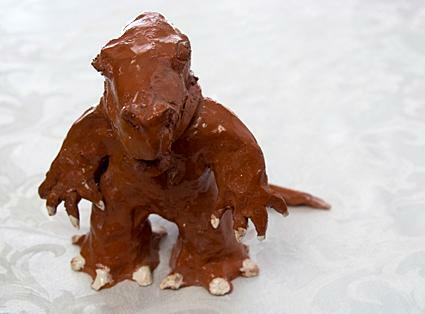 After the dinosaur is dry, kids can paint it in authentic colors. Talk to kids about the type of dinosaur they want to create, and then look up photos of that particular species. Use the aluminum foil to create a rough image of the dino. Compact the foil so it will create a solid base for the paper clay. Cover the foil base in paper clay. Work in layers, and allow the dino to dry in between. When adding a new layer of paper clay to a dry base, get the base wet with a little water. When the dino is completely dry, use sandpaper to smooth the surface and define any features. Finally, paint the dino as desired and allow to dry. For many children, hands-on activities like crafts are a very important way to learn and remember new information. If your kids are into dinosaurs or are learning about them in school, crafting can help cement the facts they're learning about these prehistoric beasts.